We’re excited to announce a number of updates to the Customers and Transactions pages that’ll make it even easier for you to access useful information about your customers and transactions. Your top customers spend the most, or buy the most number of times from your business. 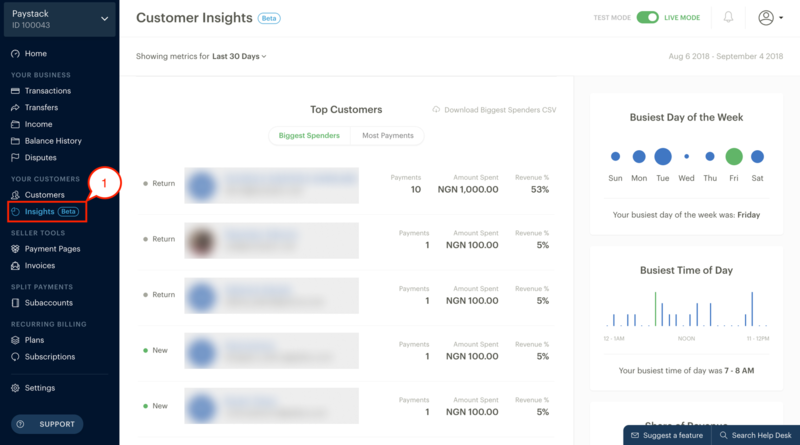 We’ve made a simple update to the Insights page that lets you export details about your top customers for any given time period. The downloaded report is a CSV file, and you can open it with any spreadsheet application such as Microsoft Excel, Google Sheets, or Numbers. Sometimes, you want to find information such as “customers who’ve had at least 2 abandoned transactions within the last 2 weeks.” The new filters let you do just that - filter through your customer list by the number of successful, abandoned, failed, and reversed transactions that customers have had within a time period. You can now filter through transactions on the Transactions page using customer email addresses. This feature helps you narrow down transactions faster, especially when you have only the customer’s email address. On the Transactions and Transfers pages, you can now save your preferred filtering options. By default, the Transactions page shows you a list of all successful transactions that your business has ever processed while the Transfers page shows you all the transfers that your business has ever done. You can now change these default filtering options such that, by default, you see transactions or transfers that fit your custom filtering options! If you need any help at all concerning any of these updates, please feel free to send us an email at [email protected], or request a phone call!